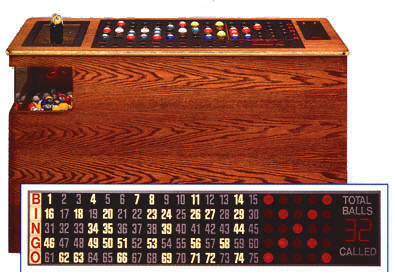 The Ultimate II Console has all the features of the Premier Console (see above), plus the machine displays the game pattern and “total balls called” count on the flashboard. This Bingo Console also has a 10-year programmable memory. This memory feature allows seven different organizations to customize and store up to 64 patterns each (for a total of 448 patterns).The Bingo Machine measures 55″ long by 24″ wide by 33.5″ high. User programmable memory enables seven different organizations to customize and store up to 64 patterns each for a total of 448 patterns. Memory remains intact up to 10 years. Electronic design eliminates costly battery replacement. Console displays the last number called, the number of balls called and the number of games played.